This journal offers a useful resource for urban designers, architects, planners, landscape architects, developers and academic researchers involved in architectural and planning education and practice. URBAN DESIGN International functions as both a vehicle for research and advice, and a truly international discussion network for scholars, academics, and working professionals engaged in the multi-disciplinary field of urban design and management. The journal includes a variety of content, from in-depth papers and reviews of projects, to book reviews, comments on previous contributions, insight from working designers; and a running calendar of international events. 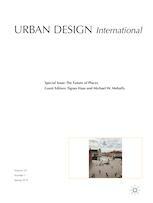 Among topics addressed in the journal are urban design, development and management; transportation and highway design; heritage and local identity; urban revitalization; inequality and suburban design; classifying community space at a historic sites; garden cities for the twenty-first century; and more.